The Dassault Super Mystere was a French fighter-bomber, the first Western European supersonic aircraft to enter mass production. The Super Mystere represents the final step in evolution which began with the Dassault Ouragan and progressed through the Mystere II/III and Mystere IV. While earlier Mystere variants could attain supersonic speeds only in a dive, the Super Mystere could exceed the speed of sound in level flight. This was achieved thanks to the new thin wing with 45� of sweep (compared with 41� of sweep in the Mystere IV and only 33� in Mystere II) and the use of an afterburner-equipped turbojet engine. The first prototype Super Mystere B.1, powered by a Rolls-Royce Avon RA.7R, took to the air on March 2, 1955. The aircraft broke the sound barrier in level flight the following day. The aircraft entered production in 1957 as the Super Mystere B.2. The production version differed from the prototype by having a more powerful SNECMA Atar 101G engine. In 1958, two Super Mystere B.4 prototypes were built. Equipped with a new 48� swept wing and a more powerful SNECMA Atar 9B engine, the aircraft were capable of Mach 1.4. Production never materialized because the faster Dassault Mirage III was entering service. 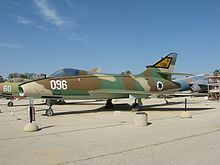 In 1973, the Israeli Air Force upgraded their Super Mystere B.2s with a non-afterburning version of the Pratt & Whitney J52-P8A and new avionics. A total of 180 Super Mystere B.2s were built. The Super Mystere served with the French Air Force until 1977. In addition, 36 aircraft were sold to the Israeli Air Force in 1958. The aircraft saw action in the 1967 Six-Day War and the 1973 Yom Kippur War. They were well-liked by the Israeli pilots and were a match for the Arab MiG-19 aircraft in air-to-air combat. In 1976, Israel sold 12 complete airframes to Honduras. In 1979, 4 more complete airframes were purchased by the Hondurans, totaling 16 aircraft. They were involved in numerous border skirmishes with Sandinista Nicaragua and were finally withdrawn from service in 1996 replaced by 12 Northrop F-5Es. The 11 surviving aircraft are for sale as surplus and 1 more is preserved at the Honduras Air Museum. Donald, David; Lake, Jon (editors) (1996). Encyclopedia of world military aircraft. AIRtime Publishing. ISBN 1-880588-24-2. Dassault Super Mystere Pictures and Dassault Super Mystere for Sale.